A couple questions–what are the actual numbers of employees in each of these occupations (N=?)? Are these workers only DC residents and employed in DC–or are you including DC residents who commute _out_ of DC and DC-employed who commute _in_? Addressing both of these would make the posting more useful and informative. 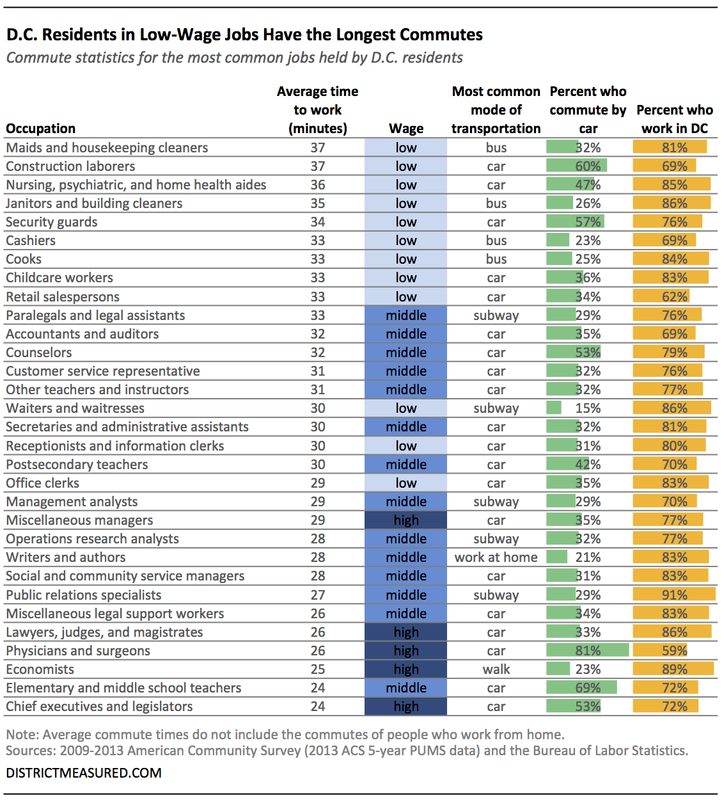 @dchistorystuff: The numbers are for D.C. residents only, regardless of where they work (though as you can see in the chart most work in D.C.). The number of residents in each occupation ranges from 3,400 physicians and surgeons to 19,400 lawyers and judges. It’s interesting that there are no IT or engineering jobs on this list, probably because most of those employees live in the suburbs, closer to work. I’ll bet those of us who do live in DC have longer-than-average commutes because the jobs are so far out.